Team Trackspeed’s principals David Ashburn and Rory Fordyce have launched their assault on the 2006 British GT Championship with the announcement that they have signed 2006 British Racing Drivers Club ‘Rising Star’ Miles Hulford, who will drive one of the Trackspeed Porsche 996 GT3 cars in the GT3 class of the domestic championship. Miles Hulford made his British GT debut in 2005, as a 16 year old in a Damax Ferrari, and scored a series of good results. "I think Miles is a special talent who can go far,” commented Team Manager Piers Masarati (pictured with his new driver, right). “He has all attributes needed and I am sure we can develop his talent further this year. We want to win the championship and signing Miles shows how serious we are." So does the fact that the team is off to Spain for some warm weather testing shortly…. 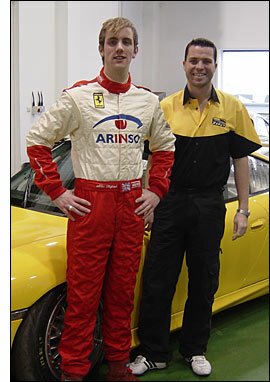 “After we tested him it was a no brainer,” said David Ashburn, “he had to be part of the Trackspeed team in 2006. We plan on forming a partnership with Miles not only for this year but also in the future. We have big plans for 2007 but in 2006 we want to win the British GT3 series." Piers Maserati has hinted that Trackspeed and Miles Hulford could be contesting some international events as well, during 2006. Trackspeed will be putting three 996 GT3s out in the British GT Championship this year: more news on Trackspeed drivers later this week.